Some accidents result in great inventions. Buffalo wings were an accident in a bar in New York. Today they are loved all over the world. 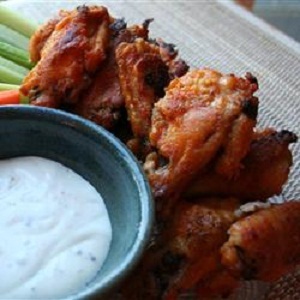 Buffalo wings are a delicacy that would make everyone at the table leap in joy. Juicy, saucy and spicy chicken wings are simply irresistible. The wings can be simply fried in oil. However, it is best to bake them to reduce the oil and fat content. Baking is a healthier process than frying. So you can actually have the same taste and quality without compromising on your health. Do not be put off with the preparation time as it contains refrigeration time too. They are extremely easy to make and are a great addition to any event. Utensils: Resealable plastic bag, baking sheet, aluminum foil, oven, serving platter, mixing bowl. Wash the chicken wings well under running water and remove the tips. Preheat your oven to 425 degrees. Take a baking sheet and line with aluminum foil. Spray the sheet with nonstick spray so that the wings do not stick to the sheet. Take the resealable plastic bag and pour in the flour, cayenne pepper, garlic powder, and salt. Shake it to mix all the ingredients together. Now add in the chicken wings and secure it. Shake again to coat the wings with the flour mixture. Take the wings out and place them on the baking sheet you prepared above. Now place this sheet inside the refrigerator for an hour at least. While the chicken is in the refrigerator, make the sauce. Take a small mixing bowl and mix the melted butter and sauce in it. You can also use any sauce of your own choice to beef it up. After an hour, take the wings out. Dip them one by one in the sauce mixture and place back on the baking sheet. Put the baking sheet in the oven and cook. Turn over the sides when the upper one turns golden in approximately 20 minutes. Once the wings are thoroughly cooked, take them out in a serving platter and serve with a dip of your choice.